A sleek Equinox tiled roof made this conservatory a joy to use all year round. With roof windows for extra light, this is not just any ordinary conservatory! featuring bi-folding doors. 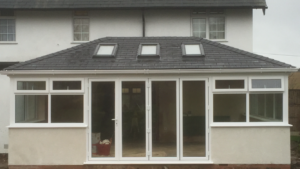 Windseal Double Glazing are approved installers of Equinox roofs.